Every one of us is filled with imagination, creativity, and ingenious ability. We need to recognize this about ourselves because it is foundational to who we are as humans, and, the fact is, everything we do and think is connected to what we believe. Our theological belief about God and our ontological (big word meaning “being”) belief about who we are comes out in everything we do. Whatever comes out of or goes into our five senses—eyes, ears, mouth, hands, and nose—ultimately reflects our values and what we esteem. Whether we are a declared atheist or a devout Christian, our allegiance is given to something, and we look to someone or something for our answers. If it’s not God, it will be science, some hip-hop artist, a commercial, infomercial, newscast, friend, Facebook post, Google, or our forever narcissistic look at ourselves (the “selfie”). Notice that all the things that can divorce our attention from God are created things and our own acts of creativity. Therefore, to create God-glorifying innovation and creativity, and to protect our worship of the one and only Triune God, we are going to need to build a theology of how God Himself creates in a pleasing way. We can’t just make things that are creatively theological, but our process and strategy in doing so needs to be considered, as well! Without God as the central light, a people and a creation are raw and useless. However, our loving and benevolent God says in Psalm 18:1 that he makes “darkness his covering, his canopy around him, thick clouds dark with water.” He says to us in Psalm 18:2, “For it is you who light my lamp; the LORD my God lightens my darkness.” Here begins the rhythm of God’s creative work. He hovers over the raw, and he begins to gather together in order. Any artist begins by grabbing at obscure ideas, resources, materials, seeming nothingness, and even networks of people when they begin to assemble something of use. This is the rhythm of all creativity. God began his first work in creation by gathering all the clutter, madness, mayhem, and discontinuity to himself by simply hovering over it and assessing all that he had (or didn’t have) to work with, and he began to order it. In Genesis 1:3, God begins his masterpiece when He said, “Let there be light.” Notice that the first thing that God infused within His creation was His very word. His creation was not first shaped by a hand, an instrument, a tool, or a device; his creation began with a belief—a belief about himself and purpose for what he would try to say. Words are like glass containers. They are spoken, but depending on how we use them, they can hold all kinds of meaning. When God spoke, not only did light come into being, but it was also filled with order, meaning, being, and purpose. By simply calling it light, God’s word declared light to be “a thing.” Therefore, God’s art began with Him infusing meaning into it. For God, there is no self-serving art—“for art’s sake” kind of art. For God, there is no such thing as art that is subjective and contains no meaning. Meaning resides in the thing itself and all the things used to assemble the thing. Meaning, then, most certainly resides in every heart of the one who creates, whether it’s verbalized or left concealed to the observer. This is profound in thinking about our creativity as humans; because we assemble raw materials—whatever they may be—we gather and collect them together, piecing together something that we infuse with meaning. Everything is a reflection of our deepest heart, and meaning always has some purpose, even if it’s just to stand and speak of beauty. When God spoke into the elements of nothingness, it says that creation responded, “…and there was light.” All of creation was and is subject to God’s word and command. Just like a paper is subject to the writer’s pen, the lamp to the switch’s spark, the computer to the operator’s fingers, the story to the muse, the song to the lyricist, and the pallet to the painter, when God assigns to His creation its place, it obeys! Light came from God’s word—a lamp, a light that glorified and looked like its source, which ordered and dumbfounded the darkness, awoke the void and formless, and points to the artist himself. All raw materials are gathered, filled with meaning, worldview, values and belief, and they respond the way the artist intends. They respond in the way the artist purposes. They become a visible reflection of the soul and heart of the one who shapes them! Therefore, there is no disconnection in art. Art always demonstrates faith in something as its source and always exudes worship of something in its obedience. “And God saw that the light was good. And God separated the light from the darkness. God called the light Day, and the darkness he called Night. And there was evening and there was morning, the first day.” The Lord, after creating everything, tasked them to go to their places and take up residence in their purposed place of service. Each item crafted and shaped by God’s word was sent to accomplish the purpose for which it was made. Light, in this case, was purposed to speak of Jesus’ light. It not only divided darkness and created separation, but it also spoke of a God who did not yet need the Sun to form light! This light, when sent, began to shape, influence, and craft the values and ethic of the cosmos. This means that all of creation began to bend and shape itself to the light that now was shining so brightly. When an artist creates, it bends culture. It inserts beliefs, values, and meaning that begin to form all that it touches. The light was not benign in that its touch could be avoided. 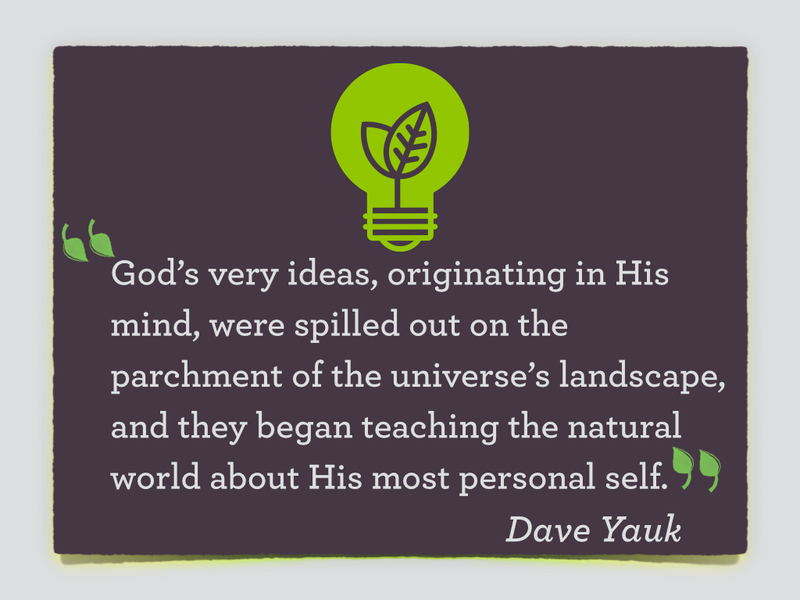 Once light was inserted into the world, God’s very ideas that once originated in His mind were spilled out onto the parchment of the universe’s landscape, and they began teaching the natural world about His most personal self. This is the process every person undergoes in doxological response to God’s word and in all thought and deed. This is the rhythm God infused into the natural world—it’s impossible to avoid. Let us give theological purpose to all that we do, and all that we are, and let all of our worship in thought and deed be filled with the word of God, infused with response to his nature and image, and sent to form and influence our world that they may look along all we create and be able to see the one to whom we point! Dave Yauk is first a foremost a follower of Jesus. He is Husband to Katie, and Father to 4 wonderful children (Naomi, Jesse, Levi, and Analise). Dave's primary passion is to seek after Gods Glory in all things, and in his contribution you'll find he holds a passion for Theology and all things Beautiful as seen in the Creator, Creativity, Character and Culture. Dave has been privileged to do ministry in over 17 countries. This has been his primary means of education and learning as a follower of Jesus. However, Dave has also had the honor of getting a B.A. from Colorado Christian University in Organizational Management and Christian Leadership, a Master's in Divinity from Liberty University, and a Doctorate in Worship Studies from I.W.S. Dave owns the Garden City Project (an online collaborative marketplace for Christian artists and innovators), Finale School of Music, and teaches online guitar for Jamplay.com. He is also a Professor of Theology, Worship and Missiology at Visible Music College and Grand Canyon University.